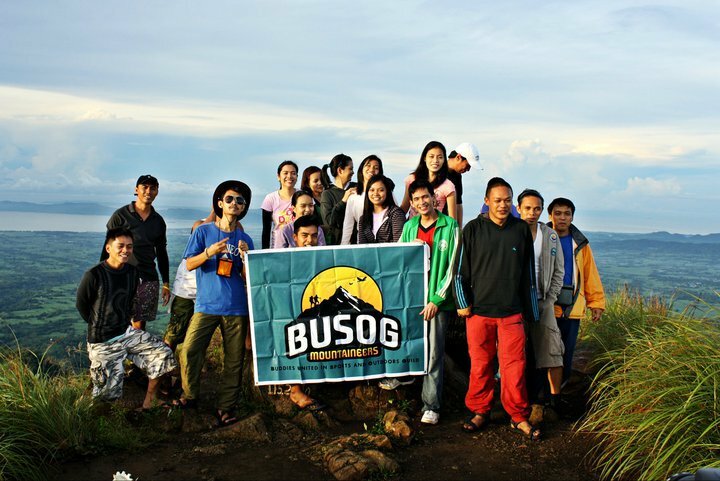 We were around 20 climbers who participated in this event— old members and newbies as some of us newly joined us, BUSOG Mountaineers. We were divided into two groups. Five of us belonged to the Assault Team. Mt. Tarak Ridge is one of the popular hiking destinations during weekends. So this strategy was planned so that we might be able to reach the campsite earlier and reserve the covered area there. Like what we’ve expected, a lot of climbers during that day climbed Tarak. We must be able to get the area which is protected from the strong winds. Otherwise, our tents would be at risk. I volunteered to join the Assault Team, together with Arnel, Riz Ruan, Rizchelle and Ian. I got a big guts to be part of it, I didn't realize that it’s almost two months that I never had any climb and I really found it so tough to ascend. Thanks to Riz Ruan who had been my companion along the trail and Sir Arjay a.k.a Chito, hehehe.. Riz never left me not only on our ascent but even on our way descending the mountain. We had our lunch and took a 30-minute rest upon reaching the Papaya river... and then PUSH! we continued the trek... it was now a very long steep assault. It was during the ascent especially after Papaya River when I realized that we were no longer part of the Assault Team although the rest of the group had not reached us yet. The three of the Assalut Team was already far away from us. It came to a point that our rest was much longer than our trek. It was like take 10 minute-rest , 5-minute resume.. and then take 10 again. Hehe..
Perhaps the reason why I got tired easily and felt so sleepy was that because it’s my first major climb plus the fact that I only got 2 hour s of sleep (since our assembly/meet up was as early as 3am in the bus terminal).. I was also carrying rice, some food and tent. My backpack was so full. It was actually my first time to carry heavy stuff like that. I used to be one carrying only the things sufficient for me alone. The trail was really more of assault and very steep along with big roots of the trees. It was really exhausting. Riz and I just told ourselves that it should have been better if we stayed in our respective home and get a good sleep. Just kidding! Of course, I did still find pleasure climbing Tarak. It was around 4pm when we reached the campsite. It was soooo cold as cold winds were embracing us. We set our camp and prepared our food for dinner. We had a good kwentuhan as we set these things. By the way, Some of the climbers had already have their tents pitched in the area covered by trees although still we got a sufficient space protected from the strong winds. Many of us had gone tired already, so socials were cut short. We just had the usual introduction of ourselves. But around 4 of us was left conversing until past 10pm. We heard and told a lot of climbing stories. Included then was Nya-Nya. A girl we met in the bus terminal who told she’s climbing alone and so we let her join the group. New climbing fellow! It was so cold around 5am, the time we planned to wake up and go to summit to witness the sunrise. It was 6am when Rizchell and I decided to summit. Afterwards, the rest followed. We reached the summit and then headed to El Sako Peak. We were not able to witness the sun rising as it has already risen by the time we arrived. What a fulfilling feeling to reach it! We had a lot of picture takings! 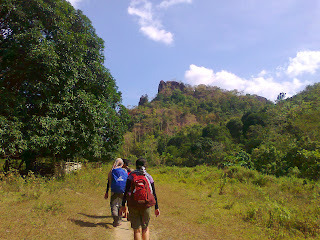 It was past 12nn when we arrived at Papaya river, had our lunch there and resumed trekking back to the jump off point. Let's Get It On, To a Paradise Called Mt. Manalmon! Our group decided to participate at the FIMO’s Climbapalooza 2011 with the theme, “Love in High Altitude”. It was on our choice of mountain and so we picked Mt. Manalmon in San Miguel, Bulacan. We took a bus going to Baliwag Bulacan. 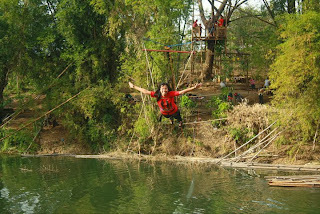 We were taken to the jump-off point of Manalmon at Brgy Kamias in San Miguel, Bulacan through a hired jeep. River crossing would be the first thing to face to start the trek with. For a typical mountaineer, one would say that it’s just a chillax (cool and relaxing) climb as a short semi-assault trail would take you to the campsite, and from there is a just 5-minute up to the summit. And I would also say that it was my most chillax and relaxing climb to date. What I love also about this mountain climbing getaway, is the place itself, which has a variety of activities to enjoy, not just another climb event . I'm in fact considering it as a great weekend escape for family bonding/vacation and even perfect for any corporate or organization team building. 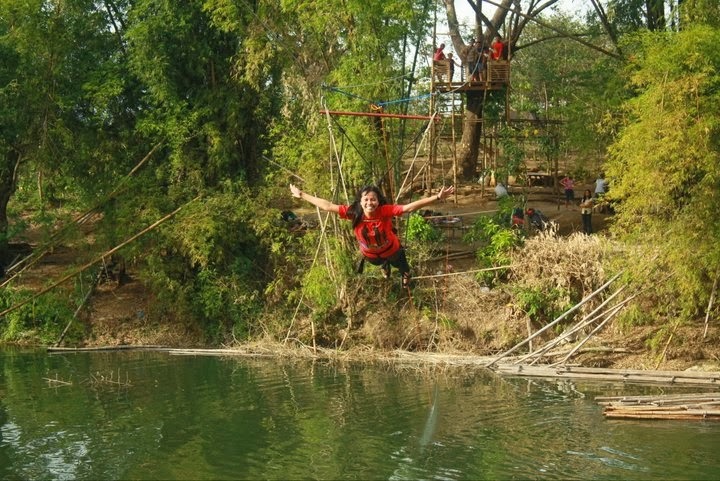 I even tried this thrice.. hehe.. enjoyed passing over the river with such thrill! 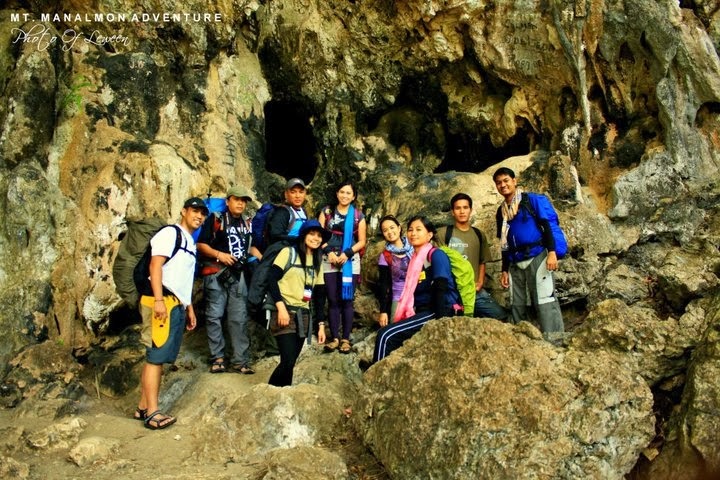 We did spelunking at Biak-na Bato. Exploring the caves was never easy. There are areas there where rope is needed to get inside. For example, upon entering the cave, it is like a very deep hole passage. There were instances too that I had to carefully manage my body in passing into those small holes, pushed myself hard as needed. One could surely have a "dapa moment" <wink>. The guide also told us to take care of the stalactites and stalagmites. These have to be preserved, he said. Once you walked on it, its glittery feature may vanish indicating that it’s already dead. At the foot of the mountain, before we assaulted we stopped by a beautiful river (photo courtesy of Leween Agriflor)..
We're so grateful for the fine weather. 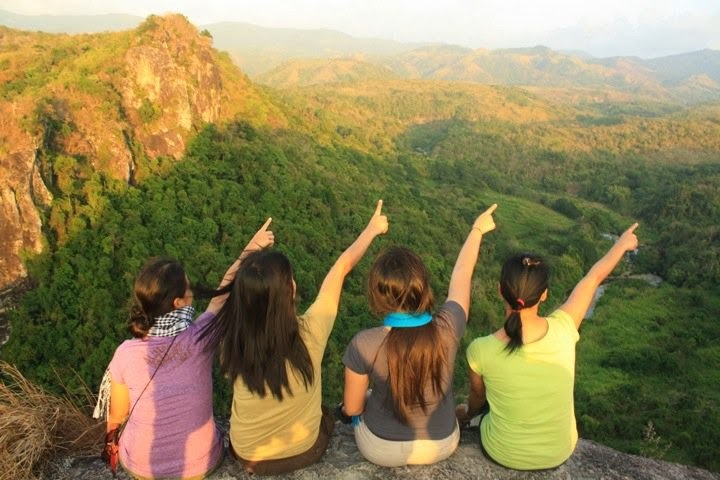 We absolutely took pleasure of the breathtaking sceneries at the top. No one could ever imagine that there is somewhere awesome like this in Bulacan province which is just nearby Metro Manila. Surely, only those few who had been there could justify its wonder. At the side of the summit , is a boulder which one can courageously try to climb it. Only two of us were courageous enough to get there. As for me, I just attempted but I didn’t push through as I was only wearing a slippery Ipanema flip flops on that morning. Just before we left for Manila, I told myself, "I will surely plan a comeback on this place." I’ve always wanted to join a mission climb. I’ve always wanted to be a part of an outreach event apart from doing a mountain climbing activity. 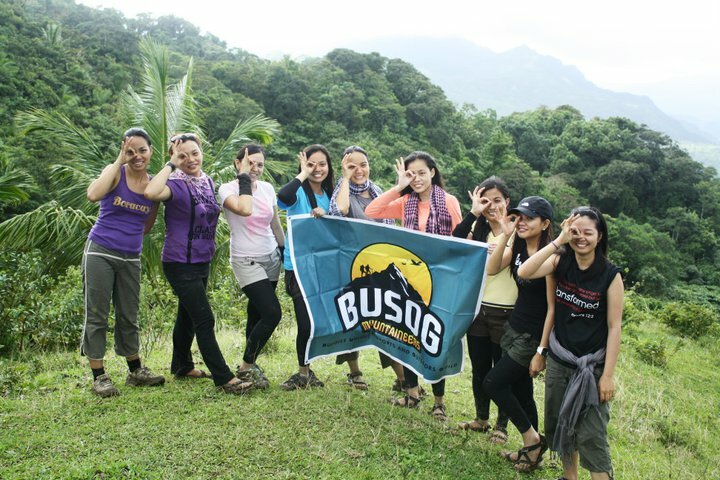 I am used to outreach activities in urban places but it’s also my desire to do likewise in my hiking getaway. 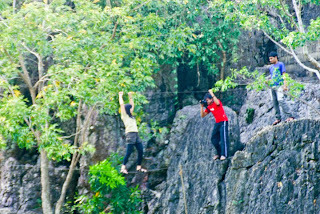 What a worthwhile activity to do it with a dual intention --- climb new peaks and enjoy the beauty of nature and at the same time, extend a helping hand to our fellow countrymen in the remote places like those who are residing in high mountains--- where there’s a limit of supplies, less quality of education and where a number of households are experiencing poverty. Incidentally, I’ve intended to do a generous deed to celebrate my birthday last month (but there was an original schedule of celebration).. And so I planned to do a post birthday climb, and “that should be a mission climb,” I told myself. When I first saw the event hosted by The Noble Blue Falcons International and Meow Outdoor Group, I got interested. It would be my first outreach/mission climb. It was set as Tree Planting, Twin Climb ( Mt. Irid and Tukduan-Banoi) and Gift-giving for Christmas. Assembly was set in Jollibee Cubao on the night of Dec 16, Friday . According to Ma’am Aisa Serencio, one of the hosts, we’re around 60 or 70 participants in this event, excluding those who backed out. (Dennis Hisanan, my climbing buddy, by the way, also participated. He was my companion throughout the climb). We were taken by a hired jeep until Cogeo and then transferred to another jeep going to the jump –off point which is in Brgy. Sta. Ines, Tanay, Rizal. I was so sleepy then, and found out that it was raining hard when we were approaching the jump off point. They said, it’s normal in that place as it’s near the rainforest. We spent a few hours until breakfast in Ynares Covered Court of the said barangay, listened to the organizers’ briefings and reminders and then started the trek. But hey, the rain continued. Really the tropical depression Sendong was approaching and developed into a typhoon. We got no accurate updates while on the trek. I just enjoyed the trail. And I was amazed. 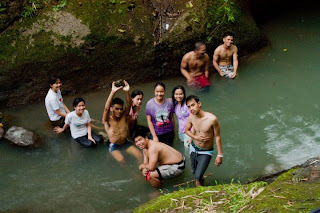 It made me reminisced the trek in the river side of Ambaguio (a trail in Nueva Vizcaya goin’ to Mt. 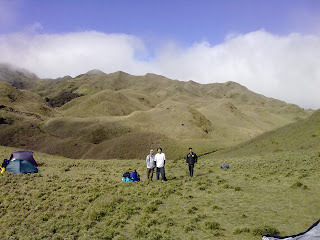 Pulag). The hike going to the venue of the outreach was a rainy one and yet the views along the trail are relaxing-- mountains, locals, rocks, and the rivers. We actually did nine river crossings on our way up to the school where the outreach program would be held at. It was my first river crossing experience and I was prepared for the current, although during that time the water flows were just calm. We arrived at the school past lunch already. The organizers facilitated the program. Since this was my first time to join an outreach in the mountain, I was just observing and did a little assistance like sorting the items to be distributed. I was delighted as I witness how the locals or participating households to be fed up were full of joy in this simple yet meaningful program. I learned that majority of the locals are Dumagat natives ( I think they have own dialect aside from Tagalog). Their appearances and features are close to that of Itas-- curly hair and black complexion. After the presentations and games, feeding followed and distribution of school items/books and old clothes. These are courtesy of various generous sponsors. By the way, I represented our group, BUSOG Mountaineers along with other climbers from their respective groups on this Reunited outreach climb. Around 3pm when the program ended and it was still raining hard. I think, only the staff and organizers did the tree planting. We started the trek going to the base camp. It was almost a two-hour ascent and limatiks are everywhere (I understand that it’s a wild forest/mountain). We arrived there and set our camp. Some of us preferred to stay at the kubo of Tatay (I forgot his name), an old man living alone in that base camp area with a dog and 4 geese. ( I remember tatay Perying of Manabu Peak. Tatay was living alone and away from his family and sometimes acts as guide). Morning came and ‘twas still raining. Obviously, scaling the summit is not possible. The participants were supposed to be divided between Mt. 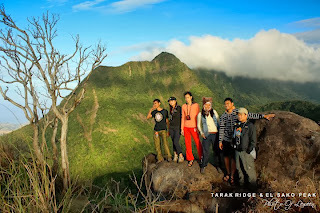 Irid and the other peak, Tukduan-Banoi. They said it would take 5 hours more from base camp to the summit. This original plan was cancelled. We had to descend before the heavier rains continue. Our dilemma was the river crossing as the water started to rise and flow heavily. I heard that if it was not possible to cross, we’ll be taking another trail with less dangerous river crossings (with the help of Tatay Gapang, the popular guide of this mountain). However, thankfully, all of us were able to manage to cross and we still took the back trail. The staff and organizers were prepared as they brought enough and reliable ropes. Nine rivers to cross from jump-off point to the school plus three more rivers on way up to the base camp-- a total of twelve. As to the water level, some are knee-level and others are of waist or above the waist. These were not the levels on our way up. As mentioned, the water was just calm the day before. Nonstop heavy rains were really the reason for the rise. We crossed all of these again on our way back. Majority of them are really with great current and kind of difficult to cross particularly for a first timer/girl climber like me. You just have to hold on and never miss holding on to the rope no matter how strong the current is to be able to cross the river. We all arrived back at the covered court of Sta. Ines wet and tired, yet thankful to God for His protection. We’re all safe. We listened to the closing remarks of the Chieftain. He extended his gratitude especially for such successful outreach. He also mentioned that with any climbing events there, their place is at least visited and many would know that there’s a beautiful place like Irid and that Dumagat natives exist. I am planning to go back and summit such a wonderful mountain, Mt. Irid, maybe summer next year. 3. Bring trekking poles if available. 4. Bring rain gear, gloves, headlamps or flashlights. 5. Bring Hydration pack or Water Bottle for the summit assault. 6. BEWARE of Leeches or “Limatik” please bring Alcohol. During this time, my desire to climb and embrace the beauty of nature intensified. I seemed to be so electrified to scale more mountains. I knew that the year 2011 would be a climbing blast for me. I planned to join more climbing events. January 2011 was a crucial period at work as it was a year end financial reporting and at the same time, regulatory audit period. 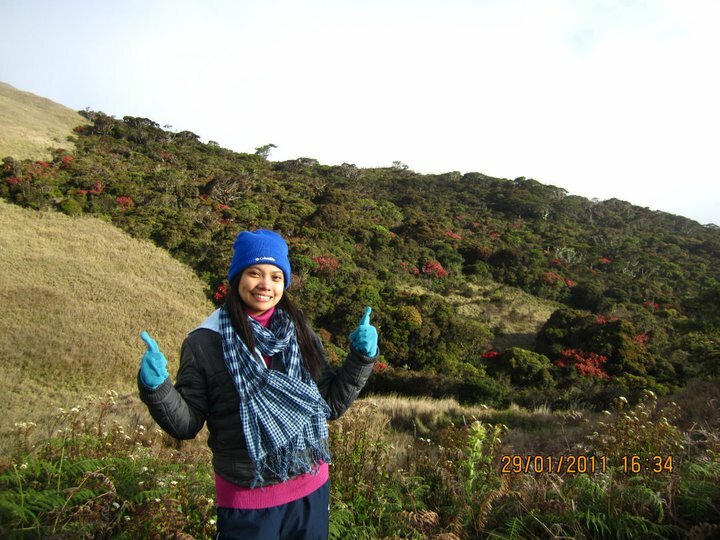 And yet I was so hopeful and excited for the much awaited first Pulag climb of BUSOG mountaineers. 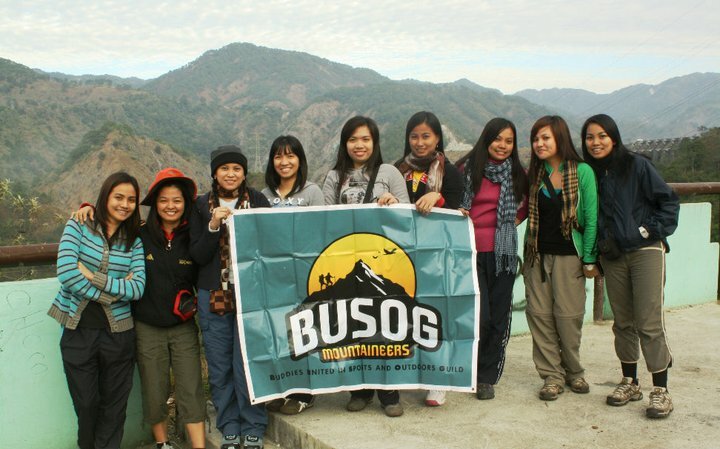 Though we learned that we would be taking the easiest trail, that was Ambangeg in Kabayan, Benguet… the fact was still we’ll be conquering the Luzon’s highest. We prepared so much for this as we knew that we should be ready for and be serious on the kind of cold temperature in Benguet. January is one of the months of the year when cold weather is literally and seriously chilling. Taking the Victory Liner on such ordinary yet exciting Friday night with most of us exhaustedly came from our respective offices and work, we arrived in Baguio at around 4am the next day. That was Saturday. We hired a jeep going to the DENR (where we attended an orientation conducted by the DENR people) and to the Ranger Station. 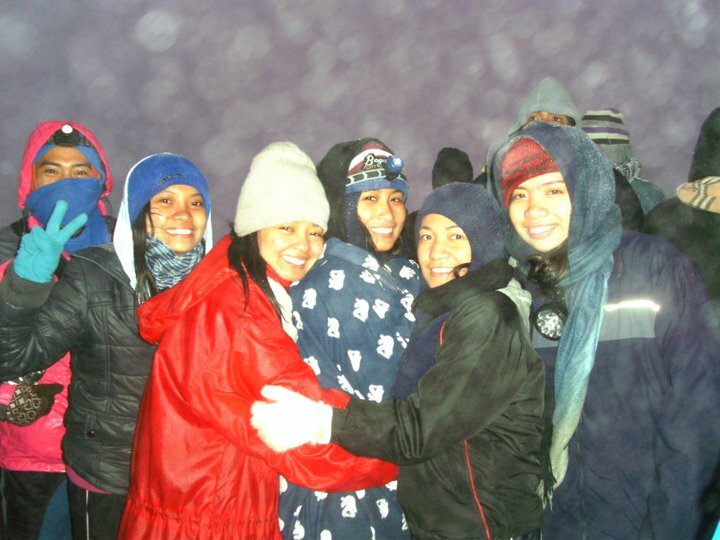 Writing this up and recalling our entire Pulag climb give me so much joy as during this time the bond among BUSOG mountaineers gets deeper. I could say that this is one of the most memorable climbs of us, particularly that majority of the active members joined. We started the trek at 9:30am. 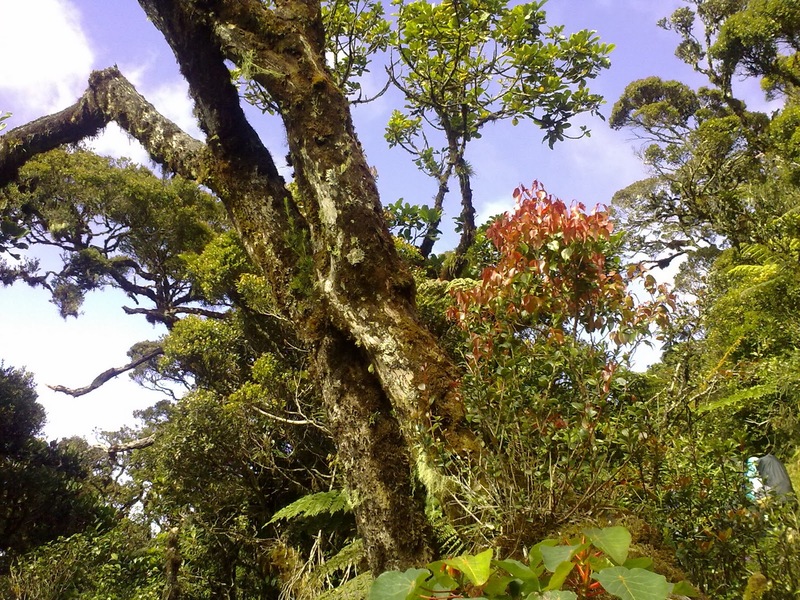 In the middle of Ambangeg trail was assault but after reaching the Camp 1, one could enjoy the rolling mossy trail. It was the first Benguet mountain that I scaled and I was really amazed by its beauty—orchids… rich mossy trees, I all love them! There was also a water source along the trail. 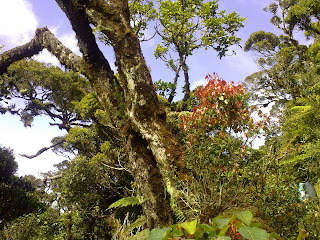 Afterwards, we started to land in Camp 2 where plenty of grass bamboos comprise the mountain. There we set our camp. I was one of the few who arrived there first. I so love it--- little grassy islet-like mountains! Time passed by, it started to get colder and colder. I normally experience cold weather but this was my first time to feel a different "chilling moment" and wow, the fact is that I was enclosed by mountain! The coldness is different compared to just an ordinary cold places I’ve been. We could not easily tolerate the temperature, and because of so much coldness, we had a very early dinner and already inside the tent by 6pm. My tentmates were Jera and Ate Elaine on a Columbia tent owned by Aris Ruan. Thumbs up for such a great tent! However, during the night, I only prayed for survival and for me to endure the cold inconvenience. .Until now, I could still vividly recall the "shivering moment" I have experienced inside the tent and the fact that I wore a 4 layered-outfit with 2 jackets included. I was lying down and it felt like I was standing in a block of ice. It felt so cold given that I was wearing thick gloves and socks. We were so early the following morning like 2am to prepare for the summit and to witness the sunrise. ‘Really funny how our noodles for breakfast gets cold in just a matter of a few minutes. After filling our stomach up, we started the one-hour trek to the summit of Mt. Pulag. It was so foggy and raining. We waited for the sunrise but nothing came up. We were just there hugging each other. There was even no clearing. It was a total fog that we witnessed. On our way down, our guide told me that just the day before, there was a sea of clouds. How unlucky! But reaching its summit for the first time at 2922 meters above sea level was already a great accomplishment. At least, there’s still a reason for me to go back. We drove back to Baguio with our hired jeep. Tired and happy for the companionship of everyone in the group and for joy in climbing not only one of the highest mountains in the Philippines but also one of the most popular ones. December 11-- an ordinary Sunday turned extra exciting. 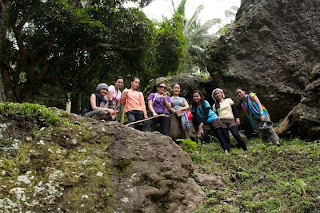 I invited some of my climbing friends and acquaintances for a dayhike somewhere in Laguna to a mountain called Mt. Kalisungan. Approaching the town of Calauan, this mountain seemed to give us a warm welcome as we view it’s bald, green peak from the highway. Bald, because it’s an open mountain (its peak is of a grassland feature). We had a safe, smooth drive going to the said town of Laguna, courtesy of Sir JP Cruz of Vagabond Pinas, he brought his van. By the way, I just met him in Facebook when I posted and invited those who want a dayhike for that particular day.He invited his 2 friends, Brayan and Shirley, while Robert, Chi and and me are from BUSOG Mountaineers. I also invited a friend, Manny a.k.a. Noy whom I have climbed with (Mt.Daguldul) and joined with, in a fun run before. We were only seven who climbed that day. Smooth drive, quiet morning, a little cloudy yet with a touch of warm sunshine--- and yes, it wasn’t raining, but right after we registered in barangay hall, the rain started to pour. There was no turning back of course as we’re already at the jump off point and we already hired a guide who invited another guide. And so they were two who accompanied us on our way up. We started the trek at around 11am. As expected, it wasn’t a smooth trek, the rain continued. The trail was so muddy and slippery. Thumbs up, my Salomon trekking shoes! It kept me safe the whole climb. Bad thing was, from white grayish, it totally became brown due to mud. We stopped by a little nipa hut full of copra where we ate our lunch and bought buko from the locals.. ‘Really good was our buko moment. That refreshing buko juice was the only liquid I filled my stomach with. I just realized that I wasn’t able to drink water for the entire climb. Wow, I was like a camel again. Perhaps it’s because, it was rainy. I didn’t perspire that much. After such lunch stop and just before arriving at the summit, the rain stopped. However, it was so muddy and slippery on the grassland of about a thirty minute-assault. I would just cling on the tall grasses so that I wouldn’t slide down. As mentioned, it was more of a grassland trail when you are about to reach the summit. Finally, we reached the highest peak marked by a cross and then we headed to the campsite. We could not view anything from the top. There was no clearing as the mountain was covered by fog. 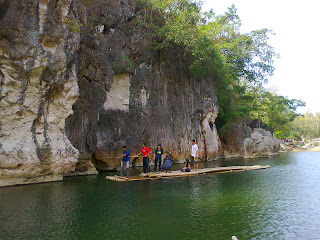 It was only for a few seconds when we were able to view two of the seven lakes of San Pablo. We just took a rest there, had some cool conversations and then started to descend. We arrived back at the jump off point at 4:30pm, tidied up and drove back home. Our itinerary had an option to go to Bunga Falls. I was just a bit sad that we didn’t get a chance to have a sidetrip due to time constraints. The event ended with a dinner at Tuding’s Porkchop in Calamba, Laguna. Perfect for our hungry stomach. 10:00 ETA Victoria, Laguna (Duck junction) / Bought food for lunch (last stop where we you can buy rice meal). It is advisable to hike after lunch time especially on a sunny weather as this is an open mountain. They don't ask for a registration fee, only a generous donation for their barangay scholar. Any amount will do. I promised myself to have only one climb every month and for the month of January, my mind was only set for Mt. 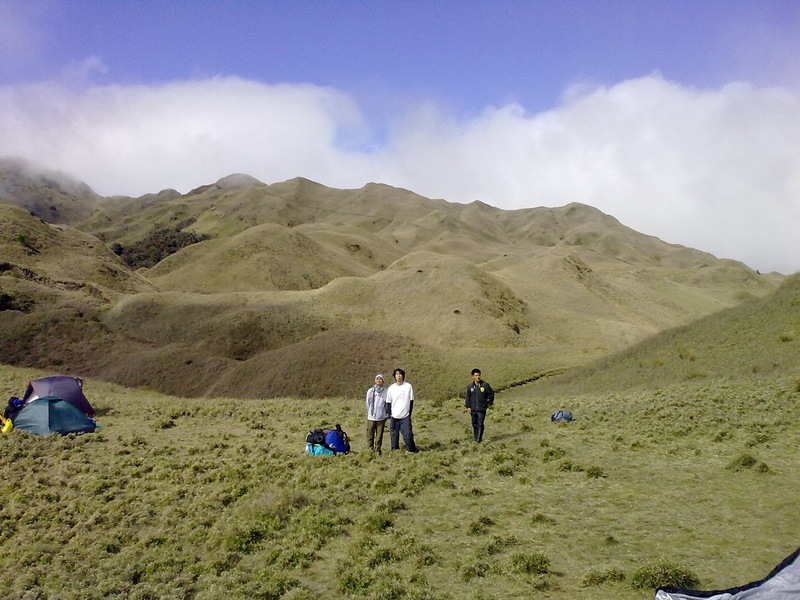 Pulag via Ambangeg . Aside from the fact that I was busy at work and we were really rendering a lot of overtime work during those days, I thought one climb a month is enough and reasonable. But it was a fine, free Saturday then, January 9, 2011. I think, it was last minute when I made up my mind and decided to join a Busog Mountaineers climb for the third time. This was my first time to do a dayhike and my very first climb for this year, 2011. 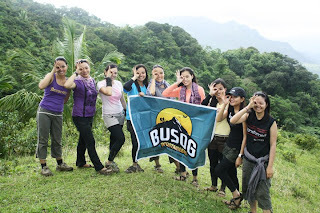 I was so excited for this dayhike---excited to do a climb with new BUSOG Friends. There were only a few of us who joined, I think, we were only twelve.. Unusual as compared with the first two climbs with them. Nevertheless, we enjoyed the trek. I remember the “pa- simple” yet super funny jokes of Ian, a.k.a vinci astig madrigal.. I always buy on his jokes. Hehehe.. thanks for the laughter you brought us during the trek. We stopped by a bunch of bamboo trees which gave a good shed for us, it’s also near a little nipa hut.. There, we had our lunch and some chitchats. Afterwards, we’re ready for summit. It was an open trail, more of grassland. We scaled through a trail that is more of assault type as compared to the other side where we descended. It was so tiring and I almost lost my breath on the 15-minute continuous ascent, just imagine that we did it under the extreme heat of the sun. That was around 1pm. Sunburn!!!!.. During the ascent, I just controlled myself and endured the heat and tiredness. I almost fainted upon reaching the summit, I swear! Or maybe because I was so full since we just had our lunch then. Thank God that I was able to manage. I enjoyed the views at the summit. From there, we could see the peaks of Mt. Batulao which is also situated in Nasugbu. What I love about Mt. Talamitam is that it’s like a Farmville.. a “true to life” Farmville hehe.. the mountain, since open and uncovered with trees, is almost comprised of plantations. This mountain is perfect for a dayhike. Actually, most climbers do a Batulao-Talamitam combo climb as these mountains are like neighbors in Nasugbu. 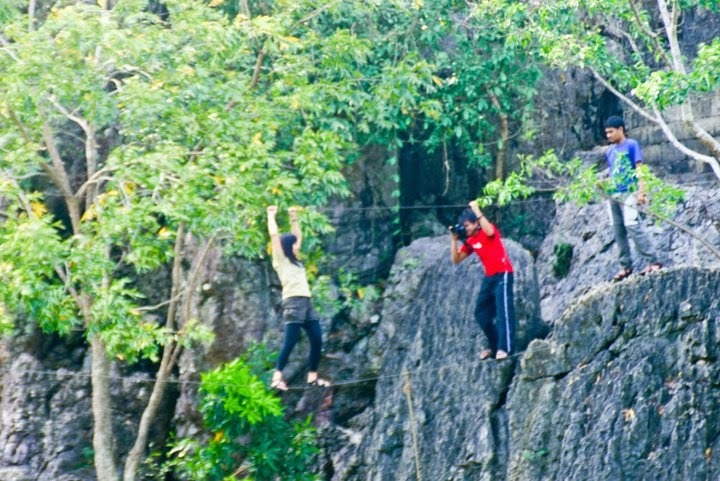 Our itinerary included an add-on—it had an Ambon-Ambon Falls sidetrip. This time, we were guided and led by David Vida, one of our companions who told us that he knows how to get there. Led by David, we went to Tagaytay City, that was past lunch at around 2:30pm. T’was like we went far away down from the city and it felt like we would never have a finish destination, I thought it would only take a few minutes or an hour, the most. But the sun has down and we haven’t reached the falls. We even joked that, this made this event a major climb. What made it difficult was the way going down to the falls. We even used a rope as it was so slippery and it seemed like there were no trails given that such areas were really steep. We had a very few picture-takings at the falls as it was already dark. The trek going to the house (friend of David) was more challenging as it was already night. We agreed to just ride a jeep and not take the trail we took on our way down to the falls.. Unfortunately, no jeep was available as it was already late evening. 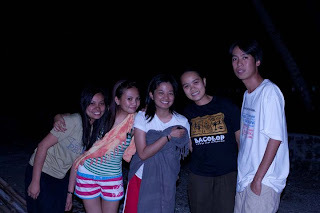 We had no choice but to do a night trek back to the city proper of Tagaytay City. Thank God for the safe hike. As mentioned in my previous blog, Batulao or Talamitam climb would never be complete without a Bulalo treat, so we had our dinner at our favorite Bulalo destination-- Mahogany in Tagaytay City. For the second time, I just enjoyed the yummy Tawilis. After the fun dinner, we headed back to Manila and arrived at around 1 am..
Thankful that I still got the strength. This event was a Saturday, and the next day was a Bull Run event which I was invited to join at (10K category). It just happened that a friend who invited me on this didn't show up and had fallen asleep so deep. He must be too tired of the double adventure that we had. My only climb for the month of December in 2010 and my second climb to date. 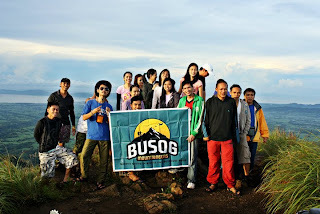 Again, this was a Busog Mountaineers event. Some of us, (I guess, they were four) went ahead on that day for some “pamamalengke matters”. Taking the Lipa-bound bus in Cubao, we arrived at around 3pm in the city proper of Lipa. Jeepney to the jump-off point had been already arranged. In going to the camp site, we passed by a number of resorts and we trekked on the rocky sea side. It was around 7pm when we reached the resort where we set our camp. It was a convenient place as we had a kubo where had a great area for cooking and for holding our socials. This event partly celebrated my birthday—post birthday celebration. They gave me a cake. A round rice cake (literally rice) pasted with margarine. Hehehe.. Good food. Good Socials. Headed by Janel and Jodick, we played two games—Pinoy Henyo & Charades. It made us laugh to death. It was soooo fun—lots of bloopers and funny moments. The guys attempted to cheat.. hehehe… but we, the girls, were still declared as winners. The next day was a day hike to the summit of Mt. Daguldul. The great thing was, we carried no fullpacks in our ascent as we would still be going back to the campsite after. We met a big number of climbers along the trail. It rained the night before and consequently the challenge to us was the mud. A very slippery & muddy trail tested us and made us a little slower as we trek. We really had to hold on to the branches of the trees so that we may not slide down. Thank God we reached the summit. Picture-takings followed. “oh Group Pic naman.. isa-isa”.. hehe. I enjoyed a likely nonstop descent as we go back to the camp site. While some were cooking, the others rested and enjoyed swimming. Spaghetti, courtesy of Charlie, solved our hungriness and tiredness. I Love Nature. I Love Mountains. I grew up in a far away province, a remote town in Quezon province, where mountains, hills, rivers, brooks and seas are so common to me. I could freely see them during my childhood days. Even before, I was so attached to the nature. I would enjoy hiking activities in our school especially during scouting days. How I remember one of our activities where we happened to miss the signs and went the wrong way in the mountain. I was one of the staff then. 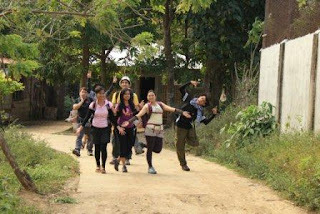 We could hardly find a way back to the camp site and we knew, during that time, that our teacher was surely worried. We were lost for about 3 or 4 hours, but all I knew was that, even around 20 other Girl Scouts were depending on us,, we carried on through the trail. I took it as an adventure, really it was. We knew we would find the highway. We passed by two beautiful falls/streams and although we were a little afraid, we just focused and listened to each other so that no one would get lost as we find the way back. We continued and helped each other. There! we managed to arrive at our campsite. Whew, how can I forget such scary/innocent experience! Hmmm, I would also join falls adventures during school break with my friends. It was fun getaways then. How I remember my best friend’s house then which is at the top of a hill. 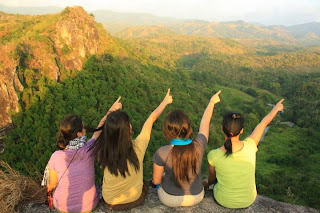 I enjoyed going and climbing there whenever I visit them or whenever we agree to go to school together. From their house, one could view the Tayabas Bay and the Marinduque island. I never knew that the mountain I was looking at, then, was Mt. Malindig which I am planning to climb next year. Now that I am based in Manila where I currently work and practice my profession, I can still recall the moment in the front window of our home where I was viewing mountains. I remember how I was looking at them from afar during my grade school, without any idea then, that time will come and I would be able to experience great mountaineering adventures, apart from being an accountant dealing with numbers and analysis throughout the week. Great to know, I am also able to be enclosed by nature everytime I go climbing. 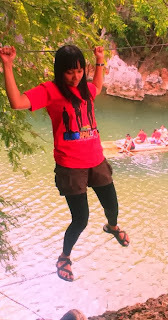 Let me freely share with you through this blog as I diarize my climbing adventures. I really love telling stories and making write-ups about everything I reach, observe and experience. Life is a voyage. An opportunity to journey. One’s feet can be elevated and taken to the top where he/she can see more of God’s wonderful creation… only if he/she never stops exploring.. . only if he/she conquers his/her very self… he/she can reach it! Anyone with faith and courage can do it! Mt. Batulao was my first “serious” climb. 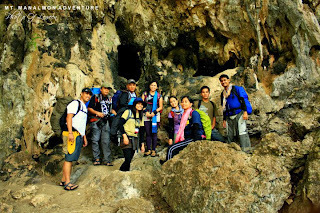 Funny, but I called it as such, not because the mountain is very difficult to climb, it’s actually a minor one, but this was my first time to join a real climb---- with group of climbers, with itinerary and with climbing gears. 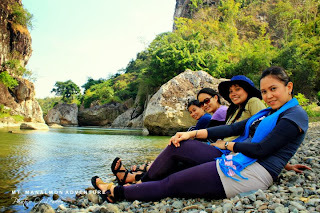 I had already some hiking experiences way way back including Mt.Pinatubo in April 2010 but it wasn’t like this. 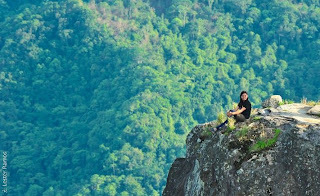 In addition, since Batulao climb, I have started to rekindle my passion to climb. Joining a number of climbing events followed after this, particularly in the mid 2011. Before, I thought getting myself with a single climbing adventure would cost me so much but I have realized that it is absolutely not, particularly if you join a group. What may cost a lot is investing in climbing and camping gears but it still depends on your gear/brand preferences. And of course, if you opt a frequent climbing getaway, that would apparently cost you more. I’d like to tell what convinced me to join a climb for the first time. 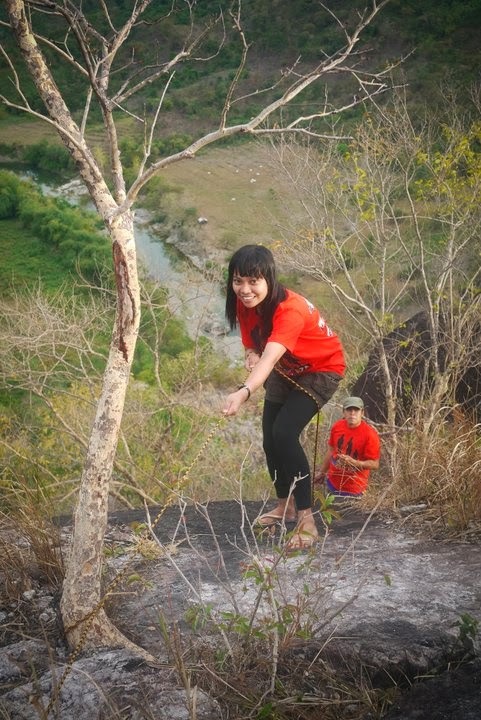 Back in September 2010, a friend and dorm mate of mine named Jera, kept on inviting me to join their group in a climb. I always declined since I would have a conflict of schedule then; I had a weekend commitment, an activity of Lingkod Community (a charismatic community I belong). Come November, the series of that activity was about to finish and I got a chance to join in this Batulao event especially when I learned that Ate Elaine, one of our dorm mates was also joining. That was November 2010. I met BUSOG mountaineers, most of them are from HP just like Jera. It was really fun. Taking the bus near MRT Taft going to Nasugbu, three hours of trip and we were dropped off at the jump off point, Evercrest Golf Course. It was already late afternoon when we started the trek, we took the new trail which they said is easier than the old one. I enjoyed the first part of the trail, picture-taking as we hike and then we went ascending and descending on a series of up-down, up-down slopes. Because I was a first-timer, everytime it was an ascent, I was so regretful that I joined the climb and in every descent or any slope that is going down, I rejoiced, enjoyed the trail and thankful that I joined, hehe. The sun was already down and darkness already covered the mountain when we reached the campsite. We were like babies, maybe because we’re guests. Tents were pitched for us and somebody (I think Rose Garbi) volunteered to cook including others who helped. As for us, we just stayed lying inside the tent. It rained a bit on that night. We’re so thankful that it did not continue to pour more. We were just called when it was time for dinner and socials. After the delicious chopsuey dinner, we’re up for socials. It was a fun kwentuhan. We, the guests, first introduced ourselves and stated the reasons why we joined the climb. New friends in the air! Yeah! I met Lauren Ramos, Rose Garbi, Rizchell Sarmiento, Riz Ruan, Leween Agriflor, Charlie delos Santos, Arnel Madrid and the rest of the gang. I shared to the group a quote on my airtime—“don’t settle for the slope, go for the summit!” I heard it from one of the talks I attended. I just found it appropriate and timely to share with others. We woke up early the next day for the sunrise at the summit. It’s around 20-minute trek from the campsite (on my pacing). And wow! 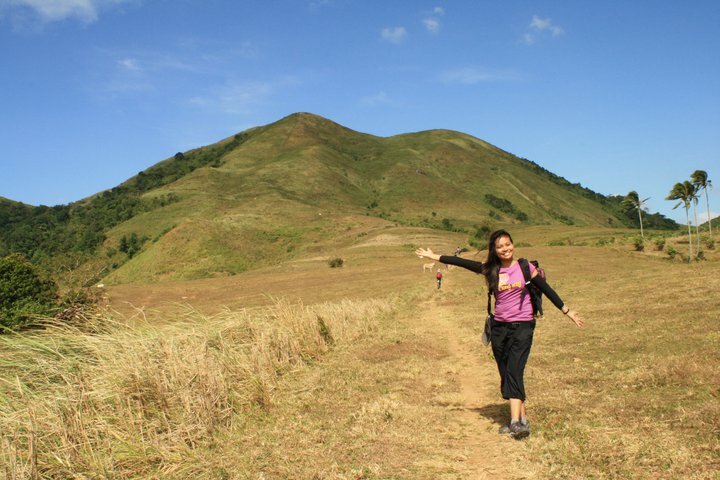 upon reaching the summit, I felt so fulfilled and proud. It was my first summit! I was in awe at the 360 degree-views. Slope-full structure of Batulao was really amazing. We had fun-filled group pics and jump shots. Now I can completely understand why it is right to start the trek in the afternoon. Batulao is an open mountain, uncovered with trees. One can really be burned with too much direct exposure on sun’s heat.. Night trek is also great in scaling this mountain. We went back to the campsite for breakfast, had our respective “tent downs” and went back to the jump-off via new trail again. 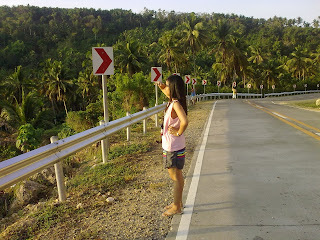 I sooo like the buko juice idea where we stopped and take rest on a small nipa hut where buko juice is being sold. Refreshingly good! I must also add that on these particular dates, there were many groups who climbed. That’s the first time I knew that in the mountaineering world, climbers call each other by “Ma’am & Sir”.. and every time they met along the trail, they greet as if they know each other. Nice one! And of course, we learned the basic of mountaineering, the LNT rule (Leave No Trace). 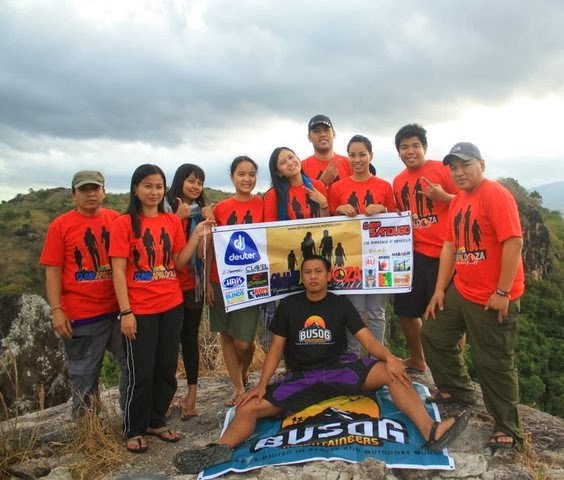 This event was originally a combo climb, Batulao-Talamitam but due to time constraints, when we reached the jump off point of Talamitam, we decided not to push through, we just stayed at the river there as our sidetrip. We had a lot of kwentuhan and piktyuran. The group really gave us a warm welcome even we were only newbies. A rewarding meal awaited us at Mahogany in Tagaytay City, an hour drive from Nasugbu. 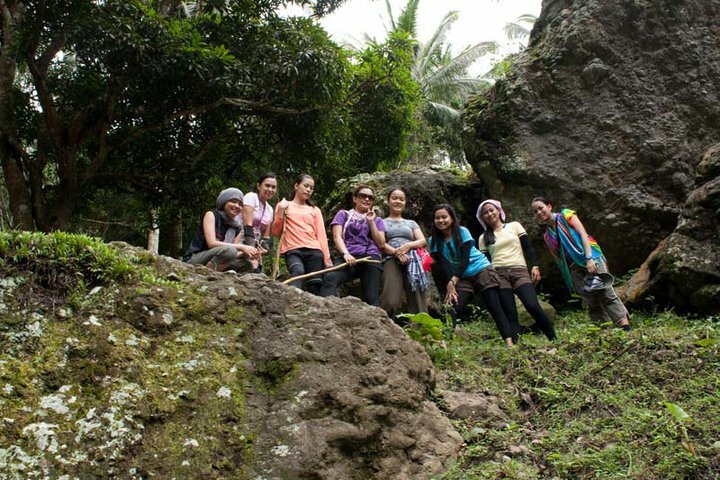 Batulao or Talamitam climb would never be complete without a bulalo reward after the climb. But as for me who is not a fan of beef, Charlie, the IT guy of Busog mountaineers, recommended the Tawilis, small fish found only in Taal Lake, it comes as either grilled or fried and then dipped in soy sauce and calamansi.. i liked it! it was really good. Tired yet full of good memories as we head back to our respective places in Manila. Life is an everyday journey. Routinary it may be, most of the time, you run through a repetitive series of your life, just like my everyday journey as a typical employee--- I wake up.. pray.. eat.. go on a normal commute in going to the office ( ride on the LRT, walk the Gateway Mall to MRT, Fort Bus).. work/analyze/deal with numbers/meetings/trainings/chat with officemates.. attend a Lingkod activity after office twice a week (I am a part of a catholic community for young professionals called Ang Lingkod ng Panginoon).. go home if there is none.. sleep, rest and thank God. Then another day again, and so forth. Repetitive in a general sense, but I think one’s daily life’s happening is still different from the other. Each and every day of our lives comes with different people, events, circumstances, problems and lessons that we encounter. And many times, we go exploring and travelling especially on weekends and holidays-- getting ourselves into a lot of events and destinations. These are what we all want, right? A break from the routines like vacations, trips, activities for a cause like outreach, fun run, etc.. I am fan of writing down everything I encounter and observe. That’s why I’m writing down my journey. I want to express. I want to dream. I want to explore. I want to tell stories. I want to discover more and tell about it.